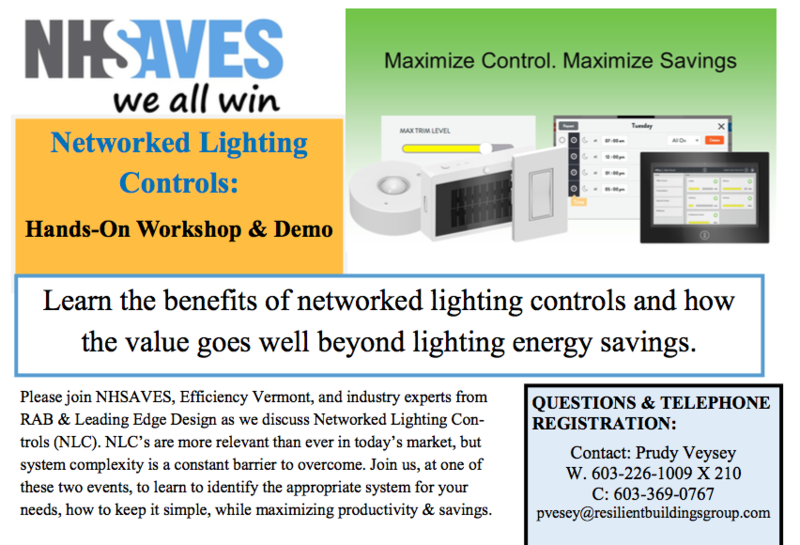 October LES Newsletter - Don't Miss Early Bird LES Conference Registration! Register for the LES Conference! -Last Call to Host Button Up! 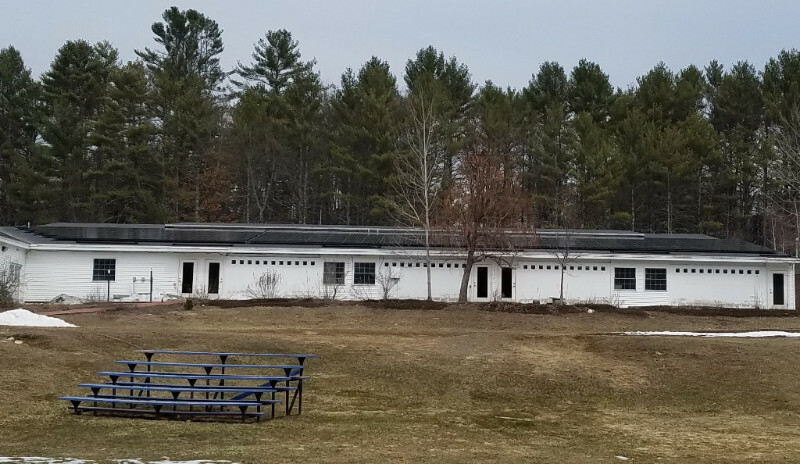 The Town of Derry activated its new solar installation at the Public Works location, 43 Transfer Lane, on Tuesday May 15th. This installation showcases a new 86.4 kilowatt photovoltaic (PV) tracking system that is expected to produce over 156 megawatt-hours of electrical power per year, representing about 4% of the Town’s total annual electricity usage. Coupled with the sourcing of renewable energy from its regional electrical buying consortium, the Town will be obtaining 49% of its electricity from renewable sources. Read more here. This summer, Froling Energy is building the Univeristy of New Hampshire's first large-scale biomass boiler system on the Durham campus. Located directly across the street from Wildcat Stadium, the new Northwest Heating Plant will provide heat and hot water to four buildings and 10 greenhouses in the Thompson School neighborhood. Read more here. 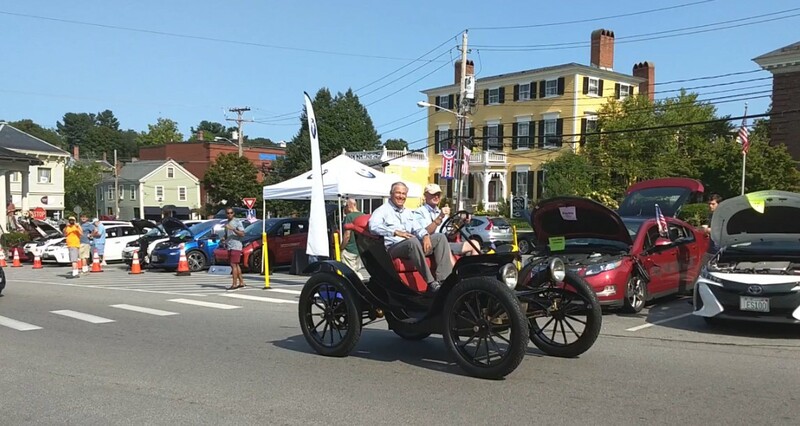 In Exeter this past Sunday at the Electric Vehicle Test-Drive Event, visiting Governor of Washington State, Jay Inslee, who has a strong stance on clean energy, takes a ride around the bandstand in one of the very first electric cars: Bart Bailey’s 1911 Phaeton. Over 25 local electric vehicle (EV) owners showcased their cars at the bandstand and nearby, including seven Teslas (models S,3,X). Folks from the greater Exeter area asked them questions about EV ownership and charging. Local dealerships provided test drives for many attendees in a Bolt provided by Amesbury Chevrolet, an i-3 provided by BMW of Stratham and a Clarity from Stratham Honda Barn. If you missed the event, you can go visit the dealerships directly for your own test drive. This event was co-hosted by Exeter’s Energy Committee and Exeter NH Transition Town in an effort to reduce tailpipe emissions in Exeter. Five other NH communities hosted Drive Electric events last month including Concord, Keene, New London, Plymouth, and Portsmouth. 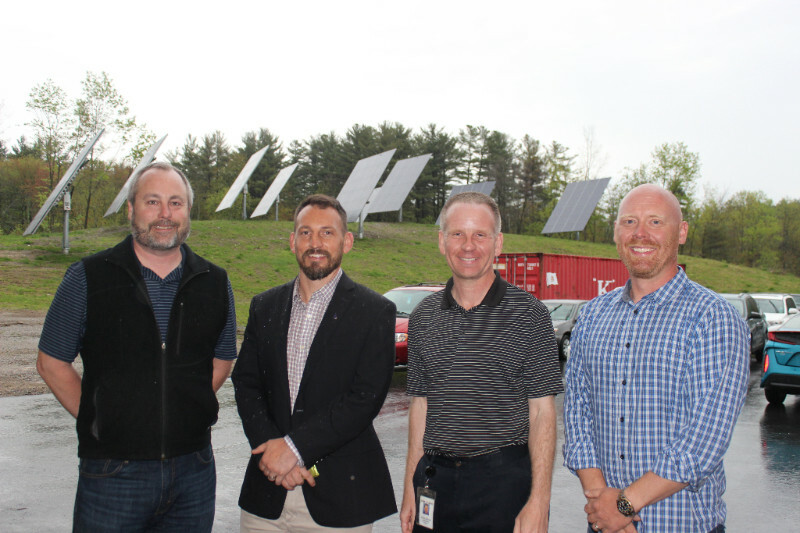 Monadnock Energy Hub holds first local Drive Electric Event in Keene, NH! On September 15th, the Monadnock Energy Hub held the first Keene, NH Drive Electric Event. With 22 electric cars from local dealers, private companies, and individual owners, there was no shortage of cars to view and test-drive. We were lucky to have a private owner allow test-drives of her new Tesla S.
But, cars were not the only electric vehicles in attendance! The Zero motorcycle caused quite a hubbub, and the electric bikes demos were met with smiles and ‘Wows’ from attendees while cruising the large parking lot. It wasn’t all test-drives though, we had informative talks from a climate scientist on a National Tour, a private owner providing first hand experience of owning and driving an electric car in NH, and finally, an alternative transportation expert discussing electric car basics and the required infrastructure. Mother Earth also provided a glorious day filled with lots of sunshine, local music, tabling from like minded nonprofits and companies, the Frisky Cow Gelato Cart cooling off visitors with gelato, and smiles all around. The day wasn’t complete until the top raffle prize – a chance to drive the Electric Zamboni at Keene Ice was announced, that’s Keene Ice for making this unique prize possible! We were pleased that Albert Diemand, Co-Founder of the Elm City Compost Initiative won while helping this event be very Low Waste by providing Compost and Recycle waste disposal. This past August, a large insulation project was donated to the Great Bay Discovery Center, as the finale of the 2017 Energize360 program. 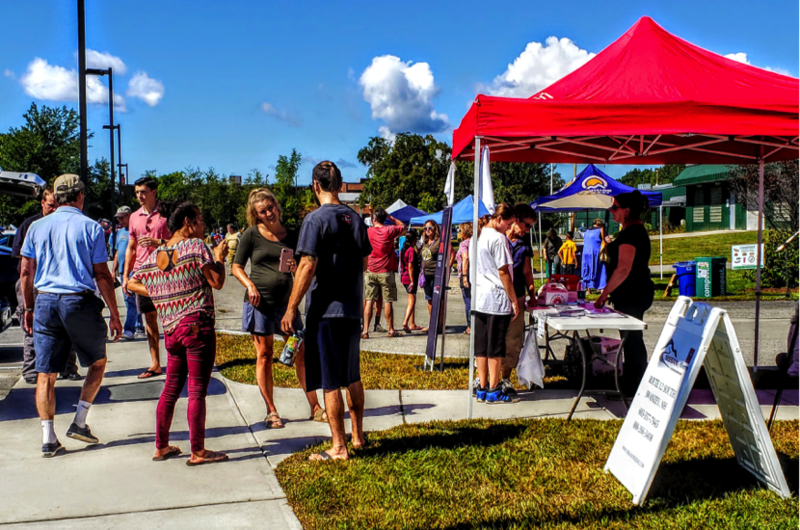 Energize 360 was a grassroots program led by volunteers in twelve Seacoast towns working to educate and empower their communities to reap the benefits of energy efficiency and renewable energy. During its six-month period, the program was responsible for 108 homes investing in solar energy, and more than 60 homes implementing significant energy efficiency improvements. As a result of the program, partner businesses donated energy services to local nonprofits including weatherization (by Yankee Thermal Imaging) for Great Bay Discovery Center in Greenland and My Friend's Place in Dover, and solar panels (by ReVision Energy) to the Children's Museum of New Hampshire in Dover. The many volunteers of Energize360 are thrilled to have helped these non-profits to reduce their energy costs and their carbon footprints. 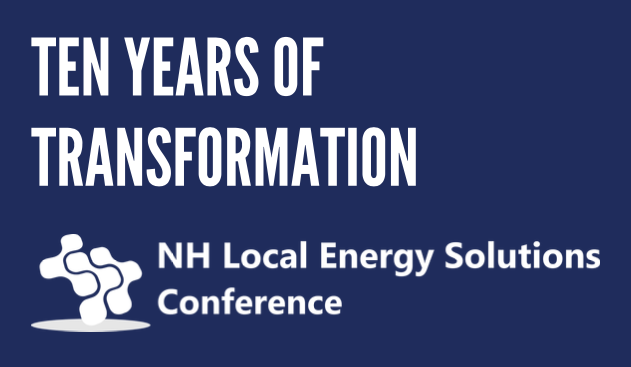 Join us for the 10th anniversary of the LES Conference, NH's premiere conference for clean energy & energy efficiency! For the first time, the conference will be held on a FRIDAY, November 16, at the solar-powered, sustainable Grappone Conference Center in Concord, NH! 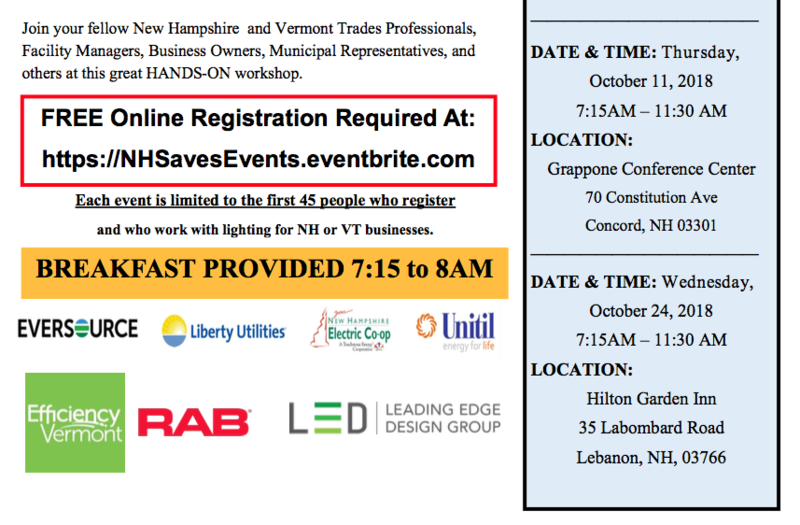 Join NHSEA, the LES Workgroup, dozens of leading energy experts, and 300 of the brightest energy champions in NH for a day of unmatched networking and information-sharing. Learn more about this year's conference and register to attend here. Whether you're an energy committee member, legislator, municipal or school staff member, industry representative, or other energy champion, the knowledge and connections shared at the LES Conference can help you thrive. A big, big thank you to this year's Conference sponsors! 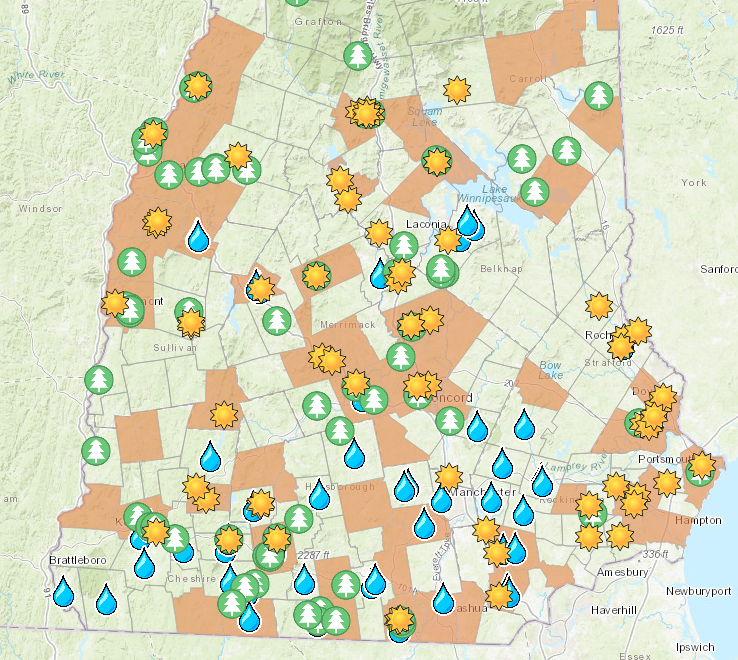 Introducing the NH Energy Dashboard, brought to you by NH Sustainable Energy Association. The Energy Dashboard is a place local energy leaders can come to learn about their neighbor's energy projects, and connect with one another to share resources and lessons. Click here to try it out. Municipalities and schools contracting for local small hydro-power. As the Dashboard grows, we will continue to add layers of other energy projects, covering energy efficiency, energy storage, municipal aggregation, and more! The Dashboard is still in development and we need your feedback. Please contact info@nhenergy.org if you have comments, questions, or a project you would like to share. USDA Rural Development is soliciting applications for the Rural Energy for America Program (REAP), which helps agricultural producers and rural small businesses install renewable energy systems and make energy efficiency improvements. The deadlines to apply for grants, which can reimburse eligible applicants up to 25% of project costs, are Oct. 31, 2018 and April 1, 2019. There are no deadlines for loan guarantee applications. Over $500,000 in grants were awarded to farms and New Hampshire businesses in 2018. Funding levels for fiscal year 2019 have not been established. Additional information about the program and how to apply is available in the August 14, 2018 Federal Register. Interested New Hampshire and Vermont applicants may contact Energy Coordinator Ken Yearman at (802) 828-6070 or kenneth.yearman@vt.usda.gov with questions or to obtain application materials. 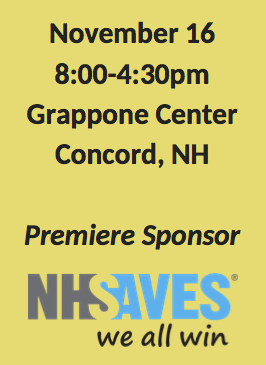 If your town has not hosted a NHSaves Button Up Workshop to date, now’s your chance! We are looking for three more towns to host a workshop prior to mid-December. All the hosts need to do is pick the date and location and recruit two to three sponsors to help publicize it locally. We will provide the presenter and the materials to publicize the workshop at no cost to you. 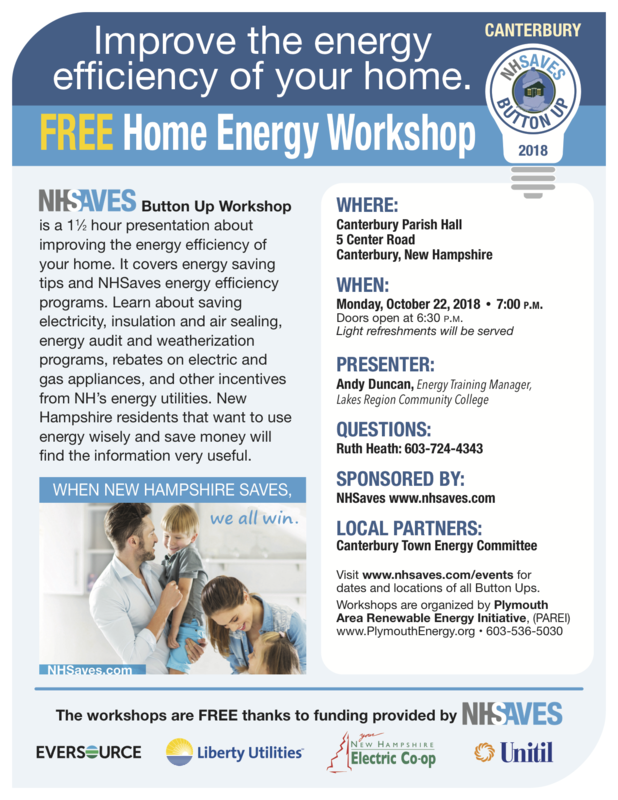 The NHSaves Button Up Workshop is a free 1.5 hour presentation about how to improve the energy efficiency of a NH home. It covers basic building science principles as well as examples of whole house weatherization measures that will button up homes for the heating and cooling seasons. 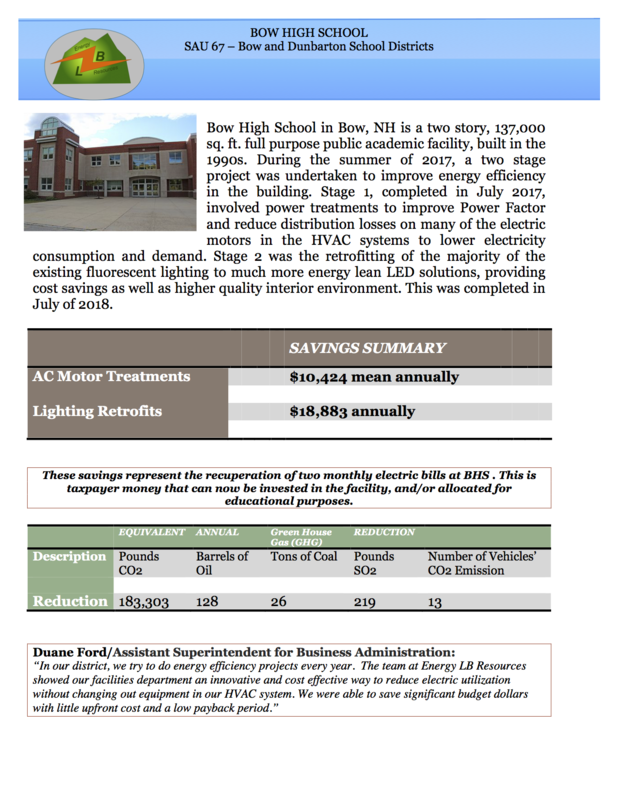 It also covers details about the energy efficiency programs offered by NH utilities to provide energy audits and weatherization, rebates on electric and gas appliances as well as new construction. 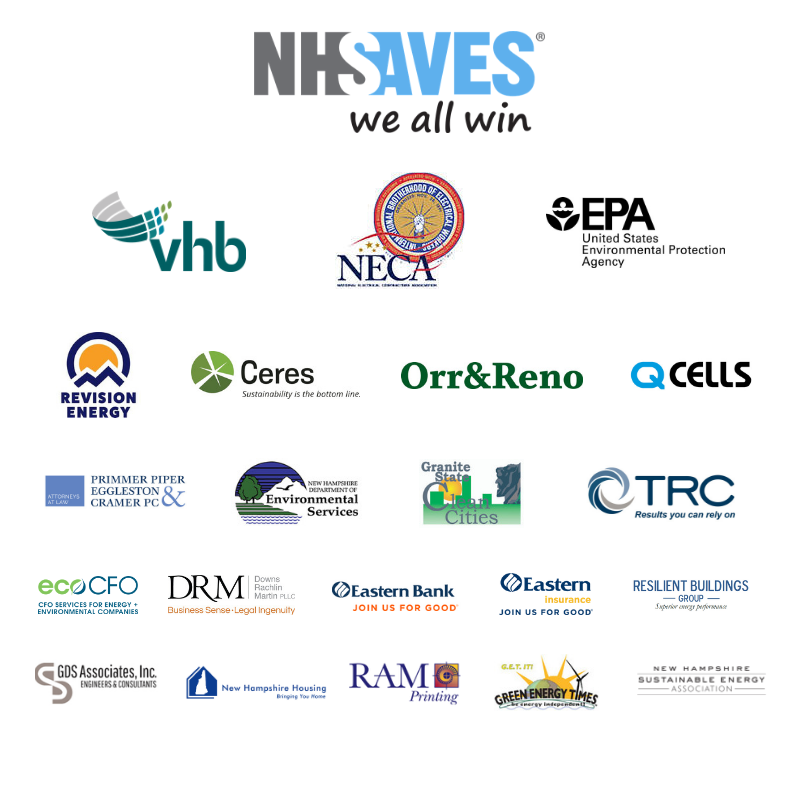 NHSaves is a collaboration of New Hampshire’s electric and natural gas utilities, Eversource, Liberty Utilities, NH Electric Cooperative and Unitil, working with the NH Public Utilities Commission and other interested parties to provide NH customers with information, incentives, and support designed to save energy, reduce costs, and protect our environment statewide. With the release of fiscal year 2019 Renewable Energy Fund program monies, the Public Utilities Commission scheduled lotteries to make sure all applicants had an equal opportunity to participate in its rebate programs and to determine the order for reviewing rebate applications. The Commission has concluded the public lottery process for the Residential and Commercial & Industrial (C&I) Solar and Wood Pellet Rebate programs. Further, the Residential Solar Rebate Program, Residential Bulk Fed Wood Pellet Program, and C&I Wood Pellet Program have funds remaining for additional rebates. The C&I Solar Rebate program funds are fully committed and the Commission has established a waitlist for this program. However, the program will remain open in case approved projects do not move forward or if an approved rebate is reduced or denied. Customers who missed the lottery can still submit a rebate application. The programs will accept and process applications on a first come, first served basis until program funds become fully committed. Funding for these rebate programs comes from the Renewable Energy Fund, or REF. The REF is funded annually through alternative compliance payments, or ACPs, received from electric providers. Under New Hampshire law, a certain percentage of energy supplied must be from renewable fuels and resources. Electric providers who cannot purchase enough renewable energy or who cannot get it at a reasonable price are allowed to meet this requirement through an alternative compliance payment into the REF. To stay up-to-date on program status and updated pie charts reflecting available funding for the rebate programs, please visit the Commission’s Sustainable Energy Renewable Energy Rebates webpage at puc.nh.gov. On September 7th the State of New Hampshire released the final Beneficiary Environmental Mitigation Plan, a plan that will dole out more than $30 million dollars resulting from the VW scandal settlement. Read the plan here. residential energy saving through homeowner participation. See full job posting here. All are invited to join Kearsarge Climate Action to discuss a 2019 Project - "Year of Energy Action for Kearsarge area." The meeting will focus on preliminary planning for Weatherize and Solarize campaigns in 2019. We are a group of concerned citizens committed to sustainable energy and climate change solutions. Contact joykubit@gmail.com for further information. Programing: Afternoon case study and tour of the Hilton Garden Inn. Do you have code questions on a project? Please contact Jennifer Thornton at jennifer.thornton@gdsassociates.com to sign up with your project details. We will provide interactive discussion featuring your questions. Two municipal solar projects owned by ReVision Solar Impact Partners are located in Nottingham. We welcome the public to join us as we celebrate the installation of rooftop solar arrays at the community center and fire department. Harnessing the sun to generate electricity will save taxpayers approximately $600,000 over the life of the systems, reducing both the town's carbon footprint and its energy costs. What: A free interactive three-hour workshop on effective methods of creating political will to address climate change. Learn how Citizens' Climate Lobby volunteers' efforts are making a difference in Washington and how you can help. There will be a break with refreshments. Our mission is to provide collaborative guidance and technical support to Local Energy Committees & Commissions, municipalities, schools, and other political subdivisions seeking to reduce energy use, minimize energy costs, and/or reduce fossil-fuel consumption. Consider joining our efforts: contact Henry Herndon for more information on the LES efforts and opportunities for participation.